We've explored the risks of getting shocked at the dock. Now, Captain John shares some easy-to-follow tips to safely handle your shoreside power and avoid electrical shock. Use extra caution anytime you need to hook up to or disconnect from shoreside power. 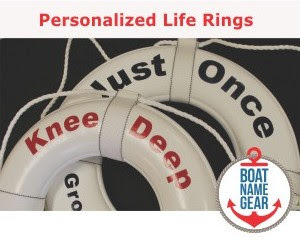 At the Chapman School of Seamanship, we used a simple 4 step process to keep students injury free and costly boat equipment safe from surges or electrical failure. Follow these easy steps to keep dockside living smooth, easy and worry-free. Never hold or walk around with the live end of a shore-power plug. Shoreside receptacles are always live! Some shoreside facilities have breaker switches to shut off the power; others have continuous live power. Assume they’re all live and play it safe. Shut down the engines and generator. Turn off switches first: lights, navigation equipment, and all accessories at the power panel. Last, turn off the main breaker at the power panel. 2. Plug into boat receptacle. The receptacle on the boat has no power, so plug one end of the shore power cable into the boat receptacle. Most plugs require a push and quarter turn to lock into place. The better plugs have a locking ring to prevent the plug from pulling out of the receptacle. 3. Plug into shoreside receptacle. Ask the dockmaster to secure (turn off) the power momentarily. 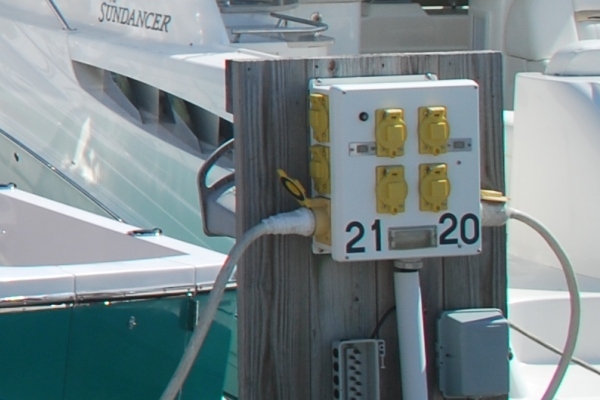 Whether you can secure power at the pier or not, go ahead and plug in the other end of the shore power cable. 4. Energize power from pier to boat. If not already energized, turn on the power at the pier. Return to the boat and turn on rockers. Then turn on the accessory and equipment switches. Turn off lights, nav equipment, and all accessories at the power panel. Check all power panels in the cabin and topside. Shut off the black or white rocker (breaker) switches last. Ask the dockmaster to secure the power momentarily. If shoreside power cannot be secured, you can nevertheless pull out the plug from the shoreside receptacle. 3. Remove boat plug; coil and stow. Remove the plug on the boat. Screw the receptacle cover plate back over the receptacle. Coil and stow the shore power cord in a dry area. 4. Start engines and energize power. Start the generator and engine. Turn on the main rocker switches first, then the accessory switches. Finally, turn on lights and nav equipment. Excerpt from “Seamanship Secrets", published by International Marine/ McGraw-Hill by Captain John Jamieson. 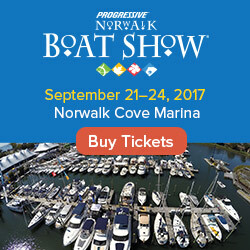 Visit his website at http://www.skippertips.com to learn how you can get instant access to 425+ articles, video tutorials, newsletters, and free eBooks. Captain John and the Magic of S.T.O.P.